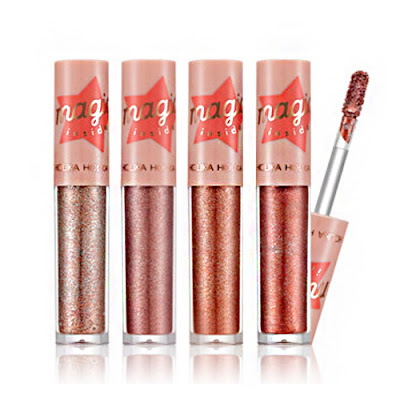 Ever since Stila released their Glitter & Glow liquid eyeshadows, I have been searching and hoping for someone to come up with a dupe for them. They have been such a hit but they are so pricey. At $24 a tube, it is difficult to collect them all if you are on a budget. Thankfully, my prayers have finally been answered. I chanced upon this product through a Facebook advert. I'm not even a huge koren beauty follower so I have no idea how the ad appeared on my feed. But, they are way more affordable than Stila. 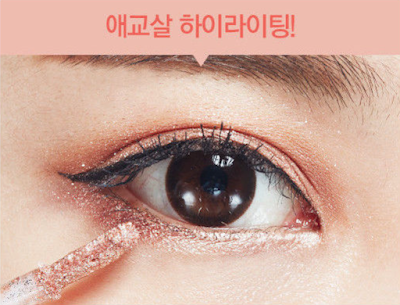 These are the Holika Holika Eye Metal Glitters. They just launched these recently and they go for about $9 on YesStyle. You get 3.5g of product, which is slightly less than Stila's 4.5ml. These come in a clear plastic tube with a pink cap. The cap says "magic inside" which is soooo true. Just like the Stila Glitter & Glow liquid eyeshadows, these have a paddle foot applicator for precise application if needed. The back of the cap has some details in Korean as well as the shade name. The manufacturing and expiry dates are printed on the tube itself. There are 4 shades in the Holika Holika range whereas Stila has a lot more. They have 11 in their permanent range and some exclusive seasonal shades. 01 Stella Dust - Light champagne with chunky silver glitter and smaller silver and champagne glitter. This applies slightly sheer with one layer but can be built up for more base color. 02 Rose Burst - Rose gold/light pink with chunky silver glitter and smaller silver and pink glitter. This applies slightly sheer with one layer but can be built up for more base color. 03 Burnt Orange - Copper with chunky silver glitter and smaller silver glitter. 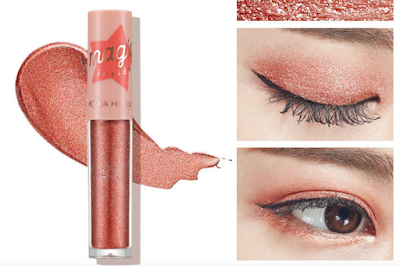 This has a very pigmented metallic copper base. 04 Fire Work - Reddish orange with fewer chunky silver glitter. This has a very pigmented metallic base as well. These swatch great. They go on evenly and pigmented. You have quite a bit of time to work with it before it dries down. I would recommend watching my video to see the swatches under different lighting in action because IT'S GORGEOUS. I managed to find a couple of dupes in my Stila collection. I do not own all of the Stila shades so this is what I have for now. Kitten Karma is a light champagne shade as well but it has a more pigmented metallic base as compared to Stella Dust. Rose Gold Retro is a pink just like Rose Burst from Holika Holika. Again, the Stila one has a much more pigmented base. However, the Stila ones are not as glittery as Holika Holika. Holika Holika definitely has more chunky silver glitter for an extremely sparkly effect. I really like the beauty editorial for the Holika Holika eye metal glitters. It really suits the "Korean" eye. Over here, they've placed the eye metal glitters on the eyelid and bottom lash line with a thin winged liner. I think it's a great way to wear these glitters in a more natural way as opposed to a cut crease. They are actually a lot more glittery in person unlike in the pictures. Both the Stila and Holika Holika ones are easily washed off with water. I had no color or glitter residue after washing my arm. Also, the glitter on both will smudge if you rub it. The base color only smudges a tiny bit so that's just something to note. On my eyes, these can last all day with no issues because my eyelids have no creases or folds. So, I don't really think my eyes are the best testers. However, the Stila ones have received a lot of good ratings and reviews so I think that is a good indication on its performance.